The Sancta Sophia College Council, Principal, Staff and Student leaders acknowledge the fine work undertaken by Elizabeth Broderick and the Project Team over the past year in their review of the current culture of the Colleges at the University of Sydney. 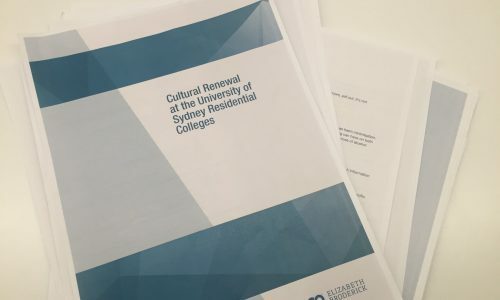 The final report into the five participating Colleges, known as Cultural Review at the University of Sydney Residential Colleges was released on Wednesday 29 November 2017 and can be found here: Cultural Renewal Overarching Report 2017. The report focusing specifically on Sancta Sophia College, known as Report to Sancta Sophia College on Cultural Renewal is available here: Cultural Renewal Sancta Sophia College Summary Report 2017 . The release of the reports and recommendations is historic, being the first into the culture of university Colleges in Australia and Sancta is proud to have participated. Both reports recognise many and various strengths of College life, yet identify that there is more work to be done for Colleges to continue their cultural evolution and model and deliver best practice in the interests of their students. We stand united and accept all the findings of the Cultural Review without reservation. We appreciate that there needs to be a shift in the way we do some things at College and we will work with determination to develop our responses to the recommendations to ensure a safer community for all our students and for all students at other residential Colleges at the University of Sydney. We will work with the University and other Colleges to develop and implement all the recommendations. At Sancta, we understand that we need to continue to evolve to remain relevant and dynamic. We are deeply committed to the renewal process.